This white cheddar mac and cheese recipe is ideal when you’re craving this comfort dish, but want a change from the traditional yellow cheese variety. Made with Cabot Alpine Cheddar cheese and topped with a lovely layer of breadcrumbs before baking in the oven, this recipe is deliciously satisfying and easy to make too! Share the recipe with family and friends on Facebook, Pinterest, Instagram, and Twitter. To make this white mac and cheese, begin by preheating your oven to 375°F degrees. Cook pasta until al dente, drain, place in a large bowl and set aside. Melt the Cabot Salted Butter in a heavy-bottomed pot or saucepan over medium heat. Add the minced garlic and cook until the garlic starts to soften and brown a bit. Using a whisk, stir in the flour, a little at a time, until it is well blended. Continue stirring, letting it cook for a minute or two. Slowly add the warm milk and keep whisking for another couple of minutes. 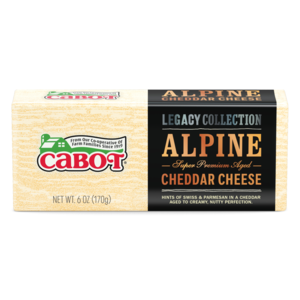 Adjust the heat to low and add the Cabot Alpine Cheddar cheese. Stir with a whisk or spoon until the cheese melts and is blended into the mixture. Add the dried oregano and dried thyme and cook, stirring for about 3 or 4 minutes. When the sauce is done, add about half of it to the pasta and mix well. Then add the remaining sauce and blend. Transfer the mixture to a lightly greased 13 x 9-inch baking dish and top with the breadcrumbs until the top of the pasta is lightly covered. Place in the pre-heated oven and bake for 20 to 25 minutes, or until hot and bubbly. For another hearty and satisfying mac & cheese recipe, try this Cuban Mac & Cheese. Cabot is a co-operative of over 800 farm families and has been producing award-winning dairy products for many years. 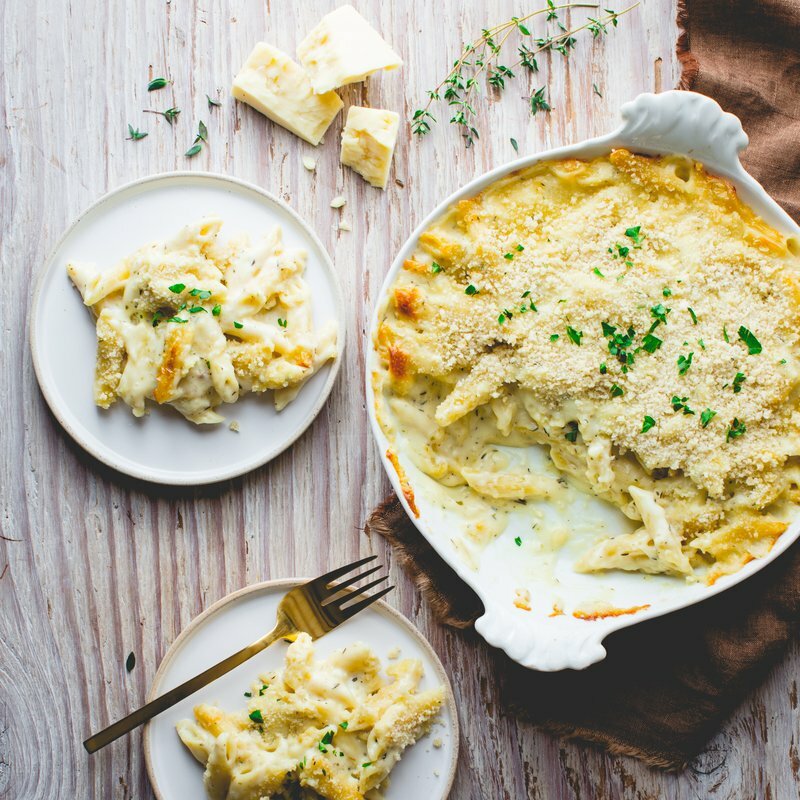 We’d love to hear your feedback on this Alpine Mac & Cheese, so please rate the recipe after you’ve tried it! COOK noodles until al dente, drain, place in a large bowl and set aside. MELT the butter in a heavy-bottomed pot or saucepan over medium heat. Add the minced garlic and cook until the garlic starts to soften and brown a little. Stir in the flour, a little at a time, with a whisk until it is well blended. Continue stirring, letting it cook for a minute or two. Slowly add the warm milk and keep whisking for another couple of minutes. Adjust the heat to low. Add the cheese and stir with whisk or spoon until it melts and is blended into the mixture. Add the herbs and cook while stirring for 3 or 4 minutes. ADD about half of the sauce to the pasta when the sauce is done and mix well. Add remaining sauce and blend. PLACE the mixture in a lightly greased 13 x 9 inch baking dish. Top with the breadcrumbs until the top of the pasta is lightly covered. Place in the pre-heated oven and bake for 20 to 25 minutes or until hot and bubbly. Recipe courtesy of Jimmy Kennedy. Photo courtesy of Katie Webster. This mac & cheese recipe is amazingly good! I served it as a side dish. Since it makes a lot, I reheated left overs for my kids' school lunches. I just put it in a little thermos, and packed it into their lunch bags. They LOVED this recipe and they love taking mac & cheese to school for lunch.